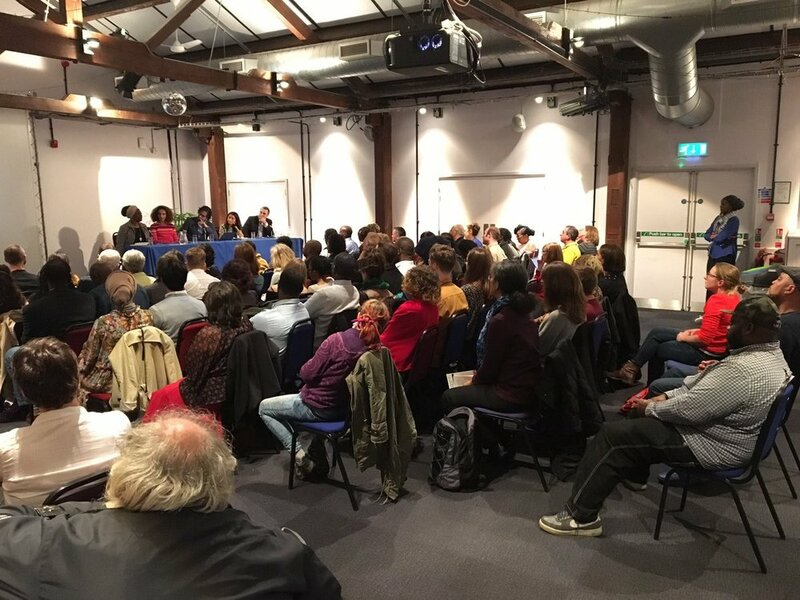 At a packed meeting in ‘ The Watershed’ on the evening of Friday 20th October 2017, an audience of people drawn mainly from Bristol’s Black and Ethnic Minority (BAME) citizens attended a showing of the documentary ‘#There IS Black in the Union Jack’ made by the emerging black-led media group 8th Sense Media. This was part of a film and history project by BSWN supported and resourced by the Heritage Lottery Fund which looks at the relationship between heritage, race, identity and belonging among the BAME communities in Bristol. The title refers to the 1987 book by Paul Gilroy called ‘ There ain’t no black in the Union Jack’ which was a critique of racism in Britain in the 1980s. The present film charts the changing nature of BAME identity in the city through conversations with BAME Bristolians across generations and genders. The documentary features interviews with members of the various communities, activists and political leaders. 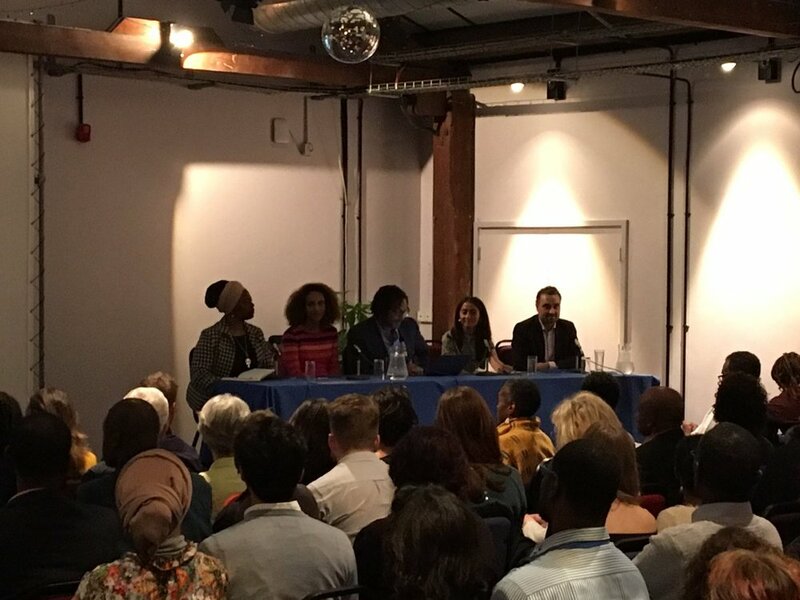 After the showing of the film discussion on the issues it raised was led by a panel of distinguished speakers ; Deputy Mayor Councillor Asher Craig, Afua Hirsch the writer, broadcaster, barrister and Human Rights campaigner, Maya Goodfellow, writer and journalist and Omar Khan , the Director of the Runnymede Trust. The discussion was chaired by David Olusoga the historian, writer and broadcaster. Wilbert Smith, West of England Manager of Heritage Lottery Fund (HLF) first briefly addressed the meeting. He said that he was delighted to announce that BSWN was now a key strategic partner of HLF and that HLF were enthusiastic about the work which BSWN was doing as part of its programme exploring race and identity. Afua Hirsch spoke of her heritage which was Ghanaian and Anglo-Jewish with the additional mixture that she had been born in Norway and had spent some time working in Ghana. David Olusoga in introducing her mentioned her recent book ‘ Brit-ish’ which is a searing analysis of British identity. Afua stated her view that Britishness is an identity in crisis and white British people have difficulty in coming to terms with the fact that it is an identity they have to share with people of colour and indeed people from all over the world who have made their homes and feel that they belong to Britain. Maya Goodfellow spoke of her resentment at perpetually having to answer the question: ‘Where are you from?’ Her background is Asian and English. When she replies: ’ Newcastle’, people persist: ‘ Yes. But where are you really from? She said that when she is asked to categorise herself as ‘mixed race’ she recoils from it. She agreed that the concept of Britishness is in crisis. There is a real problem when to qualify as being really British you have to be ethnically white Caucasian – and Celtic/Anglo-Saxon. Omar Khan explained that his background was Pakistani and Irish but that he grew up in the US. As he had lived in the UK for the past 20 years he wondered whether Donald Trump would allow him back into the US as he is of Asian appearance and has a Muslim name. He believed that people should be free to craft their own identities and not be categorised by others. He gave the example of a visit he made to Israel where he felt that his personal choice of identity was taken away from him. He was forced to chose between Jewish (or non-Arab) and Arab. He had no Arab heritage that he was aware of yet in Israel because he had a Muslim-sounding name he was automatically classified as ‘Arab’. Asher Craig said because she grew up in Bristol in a Caribbean family as a child she identified as black Jamaican. When her parents moved to a middle class neighbourhood in Bristol (Redlands) she moved to a school which was predominantly white and became acutely conscious of her blackness but said she was British. Now she was at ease with herself and her identity. She refused to be placed in a box. She was different things at different times depending on the environment she was in. If she was pushed to say what she was she would say that she is black Caribbean but is glad to be British. She spoke of the atmosphere she became conscious of when she and Marvin Rees became Mayor and Deputy Mayor respectively in City Hall and in the ‘official’ circles in which they now had to move as a consequence of the offices they held. She also had move to address the gross disproportionality of employment as far as diversity is concerned in a city where 22% of the population is BAME (including white minorities) and how all the black employees were clustered in the lower grades of manual employment. Asher went on to observe that since the audit which the Mayor’s Office had done on the inequalities in race and employment in the city she had been ‘ blown away’ by the positive response she had encountered by senior managers in both the private and public sectors - so there were grounds for optimism. David Olusoga moved the discussion to Brexit and here a gloomier picture emerged. There had been a marked hike in racist incidents since the Brexit vote. Omar spoke of a ‘post imperial melancholia’ among the British as they reconciled themselves to a new global role. The temporary period of membership of the EU which could be seen as an experiment in finding a new role had not worked as the British never were comfortable as ‘Europeans’ the way most other EU members are. Examination of ‘Leave’ voters disclosed that 38% admitted to having racially prejudicial feelings. The figure for ‘Remain’ voters was less than half of that. It appeared that the ‘Leave’ vote seemed to some to legitimise the racist feelings lurking beneath the surface. Afua referred to the reaction of member of a panel who had appeared on a programme she hosted who had referred to the Audit Asher had referred to in her contribution as a ‘ Racist ‘ Audit as if any exercise in statistical fact-finding in the area of diversity was in some way a threat. She also challenged the assertion that we were basically a ‘tolerant’ society. She did not want to be tolerated as a form of politeness. Despite all the difficulties the discussion had thrown up there was agreement that the only way forward was to keep challenging all the misconceptions and comfortable euphemisms like ‘ tolerance’ as the only way to help elements of the white majority come to terms with what it really meant to be British today . This documentary is available to view via on our Youtube channel here. The audio recording of this event and panel discussion can also be found here.